A Major Problem you wish you had, or, Historiann-thologized, again! This is what’s called a super-slow rollout, folks: a chapter from my book Abraham in Arms: War and Gender in Colonial New England (2007) has been excerpted for inclusion in the latest edition of Major Problems in American Women’s History, 5th edition (Cengage Learning, 2013), edited by Sharon Block, Ruth M. Alexander, and Mary Beth Norton. My book has now been excerpted in the two biggest anthologies of American women’s history, as a portion of my book was included in Women’s America (7th ed., 2010), edited by Linda K. Kerber, Jane Sherron DeHart, and Cornelia Hughes Dayton. Pretty cool, eh? I’m also especially thrilled because they picked a chapter about women that I was particularly proud of, and which has gone largely unremarked upon by my reviewers, most of whom have been military historians who are much more interested in my chapters on guys and guns. (Go figure! They have all reviewed the book favorably, for which I am truly grateful.) I wrote what I thought was some pretty interesting women’s history too–and I’m so gratified to know that top scholars in my field like Kerber and Dayton find value in my work. And it’s still exciting! Thanks Sharon, Ruth, and Mary Beth. The excerpt of my book in Women’s America was from chapter four; Major Problems excerpted chapter three and included it in a chapter called “European-Native American Cultural Contact,” along with primary sources by Samuel de Champlain, Fr. Geronimo Boscana, Mary Musgrove, and Elizabeth Hanson, the last of which I believe was my suggestion. The secondary sources published alongside the excerpt from my book are essays by Nancy Shoemaker about Iroquois Catholic Catherine (Kateri) Tekakwitha, and Michelle Gillespie about Anglo-Creek leader Musgrove. According to the editors, my chapter “analyzes the published stories of English women who had been taken captive by Native Americans. Women’s captivity narratives, Little argues, provided colonists with a way to understand Indian gender and family structures according to a Puritan religious and cultural framework,” 35. Only one chapter on the West? 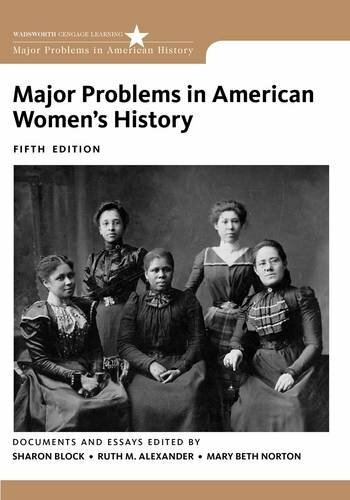 Block, Alexander, and Norton have made some pretty dramatic changes in the fifth edition, so for those of you who teach American women’s history, you should check it out. New or substantially revised chapters include chapter 2 (the one I’m in), plus chapter 4, “Marriage, Sexuality, and Family in Colonial America;” chapter 6, “Sexuality, Rights, and Activism in a New Nation;” chapter 8, “The Civil War and its Aftermath,:” chapter 10, “Paid Employment, Workplace Rights, and Modern Consumerism, 1880-1930;” and chapter 16, “Gender, Identity, and Cultural Conflict Since 1990.” Even the chapters that cover the same period or topics as in the fourth edition feature an almost entirely new slate of both primary or secondary sources, so give it a whirl and let me know what you think. ← Looking for sexism in the coverage of women candidates for office? Try a mirror. Congratulations, exciting news, and well-deserved, Historiann. Two for two, and will create an Amazon uptick! I used the whole book in a grad. class once, and for the rest of the semester they couldn’t find enough excuses to say things like “shoot that rogue! !” or too many colorful ways to insult each other’s weekly clothing choices. A form of learning in context, I thought. The only thing I ever had excerpted (I think), was a journal article, and I didn’t even know about until I stumbled on it in a random google search just before I got evicted from edition X for something else in edition Y. But, as a member of the “Steal This Book” generation, “hit print” is almost my middle name, and it was a durable warhorse of a collection with lots of readers. (Oh, wait, I recently found about a thousand words of mine, unattributed, on the decedent in question, woven into a “Find-a-Grave” entry, which I thought was kind of… interesting). Fucken awesome! And you picked an extra-salacious Elvgren to celebrate! Congratulations! That’s awesome. I raise a glass in your general direction. I can haz what’s in ur glass? Super cool. Your ideas are propagating forward in time. I’ve been thinking lately about the fates of published works in the digital age. If everything that now sees the light of day in print media converts to online, does its temporal persistence change? My notion is yes, in the sense that while the reader’s reach is farther than at the land-locked library, digital tools also make it more focussed and less random. So what persists and how will it be propagated forward? I don’t know but it causes me to think about traditional Pacific navigation, which exists primarily as an oral tradition. I read in a book on this topic (ha!) that an effect of this way of storing information is that only what is useful is retained across generations. Following from there, what constitutes the collective knowledge changes as people move from island to island. Maybe anthologies are the scholarly parallel to this. very excellent for you!! congrats!! But clearly, it’s time for me to publish another book, no? I’ve decided that my Christmas/Hanukkah/Solstice present to myself is going to be a completed ms. of the Esther Wheelwright book. So, I’ve got to get myself ready for those 4-6 a.m. writing jags, which is how I finished the first book 8 years ago. Congratulations! Well deserved…not sure whether its cool, or what you wrote is hot stuff. That’s awesome, Historiann. The Major Problems series is very good, IMO. I’m using the one on history of medicine and public health as a required text next semester. Cool! (and now I’m off to google Esther Wheelwright). Congratulations on having your work reach a larger audience and helping to shape the understanding of what questions a state-of-the art undergraduate course in the History of Women should address. At the same time, I have to ask, WHY is this new volume $110? How can we, as a profession, force a discussion of how textbook prices can reinforce educational inequality. I teach at an urban commuter campus where the majority of students are first-generation-to-college. I’ve learned that some students have actually withdrawn from courses they wanted to take because they couldn’t afford the books for all their courses that semester. some of us try to assign previous editions of good textbooks with the hope that students will be able to find used copies. But this is risky because sometimes there aren’t enough used copies in circulation for everyone in the class to get one in time. First-generation-to-college students are shocked to find that a grant-loan package that covers tuition still leaves them with huge costs for books. Adding/increasing grants for books would not be much of a solution, it would only invite publishers to raise prices even more. The Obama administration proposes identifying colleges that are a “good value” and having federal grant/loan programs favor colleges holding down tuition (among other criteria). Could some similar incentives be devised to reward publishers who hold down book prices? Could faculty join a “book-cott” pledge and promise to assign books that are priced reasonably? Of course it’s not just about sticker price. But there must be a way to draw up a list of criteria associated with best practices in pricing books. I’d really like to assign this new edition, but I can’t see myself requiring students to pay this much. And when students come from homes without a lot of books, it feels sad to reinforce the idea that books are luxury items. @Gitana re: the WHY of the cost: I wish the price were lower too — and I’m one of the authors. The cost is so high largely because a Major Problems book is made of c. 40 reprinted essays and over 90 primary documents — most of which require permissions fees. We had a permissions budget of almost $50,000, and did our best to come in at significantly below that by using public domain sources whenever possible — but that’s still a lot of money out the door. Essays cost up to $1000 to reprint, and even a short primary source sometimes cost upwards of $300 dollars. I don’t think this is an easy problem to solve — publishers are feeling squeezed too. On the good side, I note that Amazon is offering to rent *Major Problems* for under $50, which seems reasonable for a textbook that covers a whole course’s readings and has 600 pages. Sharon, thanks for your response. The rental option seems quite reasonable, and much more than most book buyback carts will give you if you bought the book outright and sold it back at the end of the term. Another reason the latest edition of the book is so expensive is the fact that after the first few semesters of it being assigned, students can readily find used copies at a much lower cost. My sense is that Cengage and other publishers think they only have a year or two at most to make any money on the book, hence the high cost of the newest editions.